Mannie Jackson, a former Fighting Illini basketball player and the owner of the Harlem Globetrotters, will have his name on the new Hall of Fame at the renovated State Farm Center. Mannie Jackson broke down barriers as a Fighting Illini basketball player and student-athlete in the 1950s, and is now helping lead the way in the Illinois Renaissance of State Farm Center with a $3 million gift in support of the Mannie L. Jackson University of Illinois Basketball Hall of Fame. 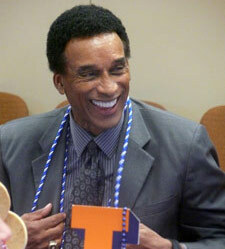 "I wanted to support Mike Thomas and his vision for the future of Fighting Illini Athletics,” Jackson said. “I’ve always believed that athletics plays an important role in developing leaders, while also engaging alumni and supporters for the University. Mike and his staff have shown tremendous leadership and hard work during the planning to renovate State Farm Center, arguably the highest-profile building on this beautiful campus." “Mannie and Cathy Jackson have touched the lives of so many, not only at the University of Illinois, but on a global level as well,” UI Director of Athletics Mike Thomas said. “The Jacksons are outstanding role models for University of Illinois students and Fighting Illini student-athletes. It is with true pleasure, excitement, and pride to announce the Mannie L. Jackson University of Illinois Basketball Hall of Fame in his honor as he has contributed so much to the Fighting Illini men's basketball program and the sport of basketball both nationally and internationally." “As a former student-athlete, corporate executive, philanthropist, Fighting Illini great, and Naismith Basketball Hall of Fame inductee as owner of the Harlem Globetrotters, we are honored Mannie and his wife, Cathy, have made a leadership gift commitment to support Illinois Athletics,” said Senior Associate Athletics Director Rick Darnell. In the new Mannie L. Jackson University of Illinois Basketball Hall of Fame, Fighting Illini fans will be able to view a wide selection of basketball memorabilia as well as relive some of the magical moments and great accomplishments throughout the storied history of Illinois basketball. The Mannie L. Jackson University of Illinois Basketball Hall of Fame will be accessible on more days than just home games so Orange and Blue fans will be able to enjoy the history and memories of Fighting Illini Basketball during all seasons of the year. The I FUND remains true to the founding principle of college sports: cultivating and preparing Illinois student-athletes to be leaders in industry, business and community. The I FUND strives to provide the best in support services, athletic facilities and academic opportunities for all Fighting Illini student-athletes. This is only possible through the continued generosity of those private individuals, families and businesses involved in the I FUND program. By providing funding to meet the rising costs of financing each student’s education, lifelong fans and loyal alumni are able to connect on a very personal level with Illinois student-athletes and the Fighting Illini athletic teams. Make an Impact. Leave a Legacy. Join the I FUND team! Call today 217.333.6595 for Champaign or 312.575.7850 for Chicago.